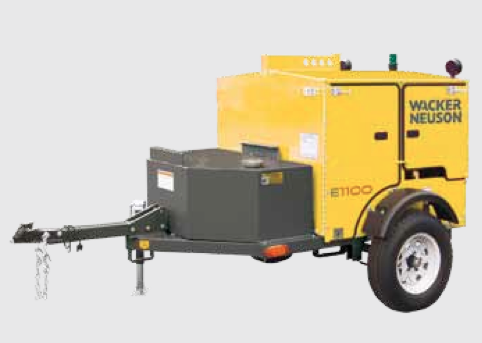 Looking to rent the exceptionally powerful Ground Heater Rental – E1100 – byWacker Neuson in Rochester NY, Ithaca NY and Western New York? Formerly known as Ground Heater, the E1100 is manufactured by a world-wide leader, Wacker Neuson Climate Technology renown for manufacturing exceptional quality Ground Heaters. This hydronic heater is designed from the ground up to economically thaw ground that is frozen, cure concrete in cold environments, and provide temporary heat. Capable of thawing 2,200 square fee, and with accessories, capable of thawing up to 6,600 square feet. Long performing with up to 115 hours of run time. Equipped with digital temperature controller. Highest performing ground heater with 87% heater efficiency. For outstanding service from the Duke Company, call 585-292-9870 (Rochester) or 607-347-4455 (Ithaca NY).